It appears that Lawson wasn’t the only one who realized that publicizing location on photo sharing sites could bring a severe privacy risk. According to a recent post on Flickr’s blog, the website, who pioneered the concept of geotagging – tagging the location of a photo – nearly five years ago, has always offered privacy settings for location. But these settings were the same as all of the other functions on the site. Meaning there are default settings for commenting, tagging, who can see your photos and location; but these are one-size fits all and sometimes a user would have to manually adjust the location privacy settings on a photo on a case-by-case basis. Flickr has always offered the ability to override the default to make the location of certain photos more private. For example, if you want to hide the location of your home, you would have to go to each picture taken in your home and alter the setting. So it was possible, but it certainly wasn’t easy! 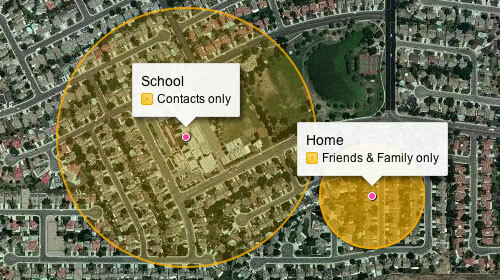 As shown at right, users now have the ability to “loop” a circle around a given location, and then determine who can see it. It very easy to use: draw a circle on a map, choose a geoprivacy setting for that area, and you’re done. Your new fence will apply to any future photo uploads and Flickr will offer to update the privacy settings on any existing images that fall within your new fence.